Kareem Abdul-Jabbar is one of the most famous and accomplished basketball players in U.S. history. Since retiring from the sport, he has committed himself to bringing history and social studies to young people and has written seven books, including the New York Times bestseller On the Shoulders of Giants: My Journey Through the Harlem Renaissance, co-authored by Raymond Obstfeld. Kareem Abdul-Jabbar lives in California. Raymond Obstfeld is the author of more than forty books of fiction and nonfiction and is a professor of creative writing. He lives in California. Ben Boos (1971-2011) is the author-illustrator of Swords: An Artist’s Devotion and Fantasy: An Artist’s Realm. A. G. Ford is the illustrator of Goal! by Mina Javaherbin and the New York Times bestseller Barack by Jonah Winter, among other titles. A. G. Ford lives in Texas. It's an entertaining and often surprising exploration of lesser-known innovators, past and present. Young Herbie and Ella are disappointed with the dilapidated state of their new house, and cranky with the didactic handyman, Mr. Mital, who seems intent on instructing them in African-American history. "There's more to our history than slavery, jazz, sports and civil rights marches," he insists. But he quickly gains their attention with stories of little-known inventors, which appear around them in foldout pages, with notes and peanut-gallery remarks penciled in by the kids. Some developments were life-changing, like open-heart surgery or food preservation, and some pure fun. Get ready to have your mind blown with this fun book. 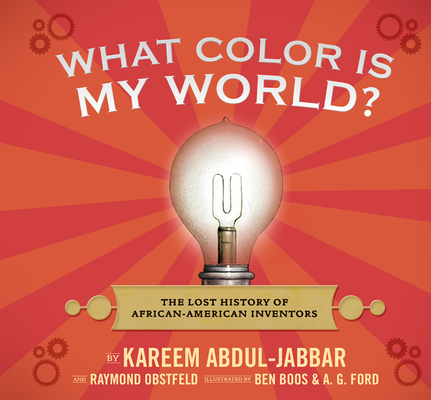 It tells the story of twins who discover the amazing stories of African American inventors whose creations changed your world...The book has lift flaps and fast facts that makes learning so quick and easy.